Example 1.) I have historically led worship for a younger crowd – middle & high-school students more than anything else, with some college-aged thrown in for good measure. I’ve found that, especially with the middle school youth, if I re-key a Tomlin song down from Tomlin-range, they – even the guys – usually mumble rather than sing. I once did an experiment using a few local Christian Schools that I’ve led Chapel worship for on occasion, simply using the song “Our God” by Chris Tomlin. Now, at church on Sunday we usually sang “Our God” in G (which is painfully low for ME), but when I led this favorite in an “adult key” for this group of middle-schoolers: NEAR SILENCE. You would’ve thought I’d asked them to recite a section of the constitution: a low, imprecise rumble and scattered murmurs throughout the room. The following week, I sang it in A, and the level of participation was significantly greater. A few weeks after that, I sang it in Tomlin key – B – and the room was a literal ROAR! The so-called “RIGHT”/”corporate” key simply didn’t work for them. Example 2.) Conferences! I could end right there – if you’ve been to one, you probably know what I mean. Sure, we could say, “When you get that many worship leaders together – they’re mostly singers anyway – they can handle the higher keys!” That’s not what I’m talking about. Go to ANY conference, retreat, or special event – not just worship conferences. No one cares what keys the songs are in – in fact, the higher, the better (within reason, of course). The higher the key, the harder you need to push to hit the note, and that striving – giving out that emotional energy – affects us on many levels. And that’s a good thing. 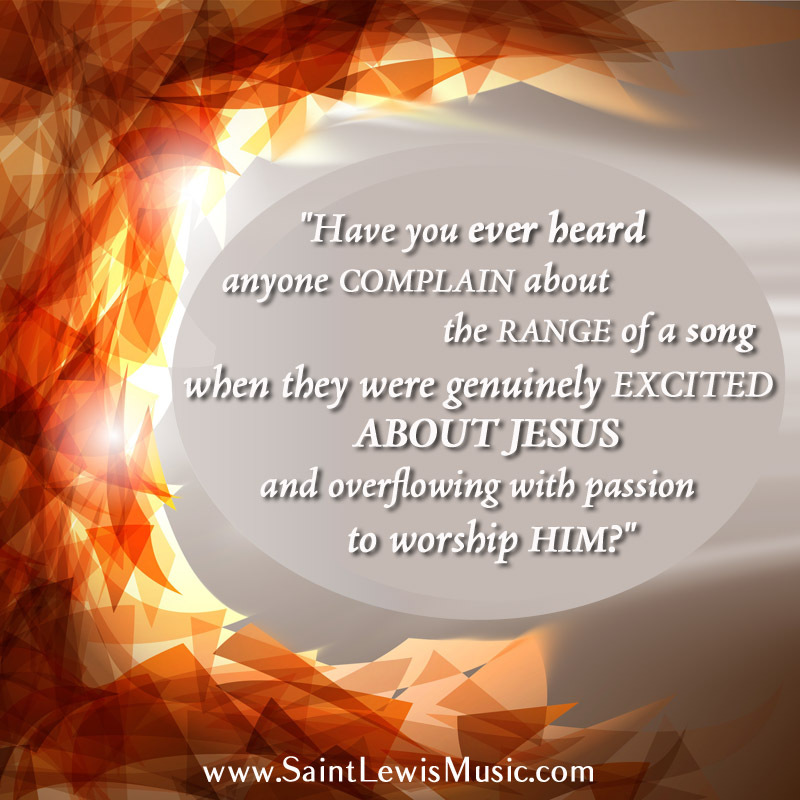 I’ve never heard anyone complaining about the range of a song when they are genuinely excited about Jesus and overflowing with a passion to worship Him. I just hear a lot of excited – and hoarse – people talking about how powerful the worship times have been and how good God is! I don’t imagine any of us have asked Journey to change the key of “Don’t Stop Believing” when belting along to every unreachable note – that’s because we don’t really care when our hearts are truly in it. Example 3.) I have a high vocal range. Most of Tomlin’s original keys do not strain me – in fact, they’re quite comfortable. As a worship leader, I have a responsibility to – yes – sing the song within a range the congregation can reach, BUT ALSO to lead the song as strong as possible. Part of my call is to sing it confidently, with passion & energy. If I’m mumbling notes and slipping consistently off key I am a distraction and not as effective a worship leader as I can be. Example 4.) I’ve been to many “worshiping churches”. There, the worship leaders & teaching pastors have done an excellent job of training their congregations in the area of singing to God. Do you know what? There, keys they sing songs in their seem to be of little to no consequence: they just LOVE TO SING! I mean, I’ve been in environments where the worship leader (a guy!) led “How He Loves” in D! D! You heard that right: D! Even I lost my voice trying to keep up, but the room was a ROAR with passionate praise. Honestly, that’s when I took note: they key didn’t really matter that much – we need to TEACH the whos, whys & hows of worship. That’s when we’ll see our people sing. So, if this is controversial, so be it – it’s true. I understand the heart behind wanting to key songs so everyone can sing comfortably, but I’m not convinced of it as a hard and fast rule. In fact, there are instances when I wonder if we are keying ourselves down to the lowest common denominator – trying to make worship easy & comfortable, when that’s not the point. Sometimes we NEED to reach – to be called to a little discomfort – to be stretched – when offering a “sacrifice of praise.” In fact, experience tells me that we are hard-wired to do so: it alters my experience of God when I give everything to Him in worship – I have a greater sense of both His presence and I even feel His “smile“. So – yes – consider prayerfully how you key each song, but consider other factors as well – the “sweet spot” may be higher than you think. It may be a good moment for your people to be stretched a little. As my friend Ryan Egan stated, one “Golden Key” is not a key at all – rather it is knowing your community and keeping them in consideration when choosing songs and keys. Can you think of any other “Golden Keys” to consider when preparing to lead corporately? I’ve always backed away from that “golden key” as well. 1) what key can the lead vocalists sing it in with the most energy and comfort for them? I typically lead so that there are multiple vocal leaders per set, so the range might vary song to song which lends itself to giving a little something for everyone. 2) what is most accessible for the given band for that day? If I’m working with younger musicians I also take into account what is going to be the least problematic for them to play. Sometimes that means choosing a different key than the original. Other times it means capoing it up and rocking the original key. Great thoughts man. Definitely something id love to repub over at TWC.